The arrival of Derek and the Dominos on the British and American music scene in early summer of 1970 and the autumnal release of their one and only studio album Layla and Other Assorted Love Songs is an epochal event in rock history. Their very existence was one of those happy accidents that in retrospect marked the central point in a momentous era when musicians were discovering The Band, Cream and The Beatles were splitting up and the millionaire super group concept was about to take off. Add in major characters of the day like George Harrison, Phil Spector, Delaney & Bonnie Bramlett, the Allman Brothers, Joe Cocker (and The Mad Dogs & Englishmen circus) and you have a thick slice of intrigue. Eric Clapton of course fronted Derek and the Dominos, on the rebound from Blind Faith, and while they weren’t quite as short lived as that exalted ensemble they were still only really in existence for a year. The legendary song “Layla” wasn’t even a substantial hit on release, neither was the album in the UK but both have grown in stature over the intervening 45 years. The live In Concert, The Layla Sessions: 20th Anniversary Edition (later upgraded) and Live at the Fillmore flesh out the tale. For the sake of happenstance our story begins August 14. Summer of 1969. Oakland Coliseum. Eric Clapton, Rick Grech, Ginger Baker and Steve Winwood are on stage during the US tour to promote their super group Blind Faith. As the English rock lords, two ex-Cream, a Traffic and Family man, lay waste to America’s largest venues it’s known within the ranks that they aren’t enjoying the experience - unlike their support acts, Taste from Ireland, a young group called The Free, and a ramshackle mob of Southern hippies calling themselves Delaney & Bonnie & Friends. Unlike Blind Faith they are having a fantastic time. Clapton’s good friend George Harrison had recommend them to Clapton, after hearing the duo’s debut album Home, and had even tried to sign them to Apple Records. Finishing the six week Faith trip in Honolulu Clapton steals the Bramlett husband and wife team, plus their core band members: drummer Jim Gordon, bassist Carl Dean Radle, pianist Leon Russell, singer Rita Coolidge, the brass of Bobby Keys and Jim Price, and a 20-year old Hammond B3 organist called Bobby Whitlock. The ragtag bunch of musicians from Illinois, Mississippi, Memphis TN and Tulsa OK begin rehearsals November 1969 for Clapton’s debut solo album (August, 1970), also featuring Stephen Stills, which will be recorded in LA and London with Delaney producing a bunch of down-home roots rockers. Whitlock stuck around the Bramletts to record their fourth album, To Bonnie from Delaney, while their live album, the hastily assembled On Tour With Eric Clapton, hits the American Top 30. Captured at Croydon’s Fairfields Hall this set found Whitlock sharing a stage with Dave Mason and George Harrison and forging a rhythmic bond with Radle and Gordon. Decked out by his aristocratic gipsy pals, stuffed with fabulous antiques and vintage Persian rugs, Hurtwood was the archetypal Rockbroker Belt residence. Whitlock was in his element. After knocking off a couple of none-too taxing sessions for Doris Troy and some production on an unreleased PP Arnold effort, Eric is itching to play properly. Keltner never makes it over so Jim Gordon deputises. “For a while we also had us ‘the Domino flat’ on 33 Thurloe Street, by South Kensington tube, round the corner from the Queen’s house. A real posh neighbourhood”, recalls Bobby. Briefly available as a single these songs can be seen as tentative first outings for Derek and The Dominos. The band made its live debut in the new guise at the Lyceum Ballroom a few days later where Harrison and Dave Mason joined them. The initial idea was to use Eric’s nickname, Derek or Del, while the American contingent would be The Dynamics. But joker Tony Ashton, of Ashton Gardner and Dyke, kyboshed that when he introduced them as Derek and the Dominos: the name stuck. Tiring of his ‘Clapton is God’ moniker (most famously seen as graffiti on a corrugated fence next to the Angel tube station), Derek and the Dominos offered a stab at credibility. Clapton was in his element again, playing Delaney stuff like “Blues Power” and blues favourites “Crossroads” and “Spoonful” but now with a funkier edge than Cream’s progressive, solo flash style had dictated. The Dominos were tight-knit, traveling to small venues in Dunstable, Great Malvern and Torquay in Eric’s Mercedes, despite the fact he didn’t have a driver’s license. While this incognito tour set the groundwork for what would become the lavish double, Layla and Other Assorted Love Songs, the boys combined feverish playing and manic excess on the road that summer, before decamping to Miami’s Criteria Studio in late August to record the album with Tom Dowd, the multi-track pioneer. The Layla album was made in extraordinary, emotional circumstances. Obsessed with Harrison’s wife Pattie, Clapton wrote her a succession of open love letter songs including “Bell Bottom Blues” and “I Looked Away”. Since he found it hard to take his own lyrics seriously Eric’s main partner was Whitlock, an ingénue with bags of belief and a good memory. “I was not credited for helping write a lot of that material. That's part of the ego thing. Had I been credited on “Bell Bottom Blues”, that would have meant I had more songs on the Layla album than Eric.” That song, written in response to Boyd asking Clapton to bring her home a pair of blue bell bottoms from the US, predated the arrival of Allman and is remarkable for Clapton’s multi-track lead guitar, the percussive mix of snare and tabla and a romantic bluesy lyric that moves the form into the late-20th century. Whitlock also played the infamous piano coda on “Layla,” the one that is always credited to Jim Gordon. “That’s wrong. He did play a few notes but he’s not a piano player. He plays so straight - everything is right on the money. They wanted me to give it some feel, so Jim and I recorded it separately and Tom Dowd mixed them together.” In any case, Whitlock believes that Rita Coolidge came up with initial melody. Maybe we will never know. Allman’s guitars mesh with Eric’s on eleven tracks, including a gorgeous reading of “Nobody Knows You When You’re Down and Out”, Billy Myles’ “Have You Ever Loved a Woman” and Jimi Hendrix’s “Little Wing”. Just as Jimi Hendrix had inspired him to form Cream, Duane Allman’s addition to the Layla sessions provided the catalyst for a lot of the music made in Miami but it was a mutual appreciation society. Allman described Eric as “a real fine cat a man of the street and a gypsy. 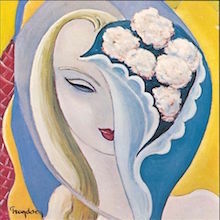 It was an honour to play on the Derek and the Dominos album with people of that magnitude, with that much brilliance and talent.” As ill-luck would have it both Hendrix and Allman would soon be dead. Returning to England the band recommenced touring but the previously intimate venues were replaced by large auditoriums where the band took to wearing ‘Derek Is Eric’ badges in an effort to promote the album, which had got such a lukewarm response. In Concert, taken from two October 1970 dates at the Fillmore East, eventually documented the legendary US tour. We recommend the 40th Anniversary Super Deluxe Edition and the 2013 issue, remastered with Blu-ray and Blu-ray audio: that’s the nuts. Vinyl fetishists can also seek out the singles, “Bell Bottom Blues”, the Spector-production “Tell The Truth”/”Roll It Over” (though beware of counterfeits; originals are rare), “Layla” and the awesome “Why Does Love Got To Be So Sad”, a track that captures the essence of the Clapton-Whitlock partnership. In retrospect we can see the importance of the Layla album and still be puzzled as to its tepid reception, especially in the United Kingdom. After all, the Blind Faith LP topped the charts on both sides of the Atlantic a year earlier. One reason may be that George Harrison’s All Things Must Pass was about to sweep the competition away on a wave of Hare Krishna transcendentalism, “My Sweet Lord” and all that. At their moment of implosion The Beatles were bigger than ever. Of course, Clapton was sick of being tagged as God himself but his divine “Presence of The Lord” survived the transition from Blind Faith to the Dominos’ live set. It was 1970. Time for the rock church. 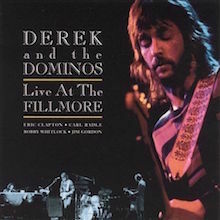 In his liner notes, Anthony DeCurtis calls Live at the Fillmore "a digitally remixed and remastered version of the 1973 Derek and the Dominos double album In Concert, with five previously unreleased performances and two tracks that have only appeared on the four-CD Clapton retrospective, Crossroads." But this does not adequately describe the album. Live at the Fillmore is not exactly an expanded version of In Concert; it is a different album culled from the same concerts that were used to compile the earlier album. Live at the Fillmore contains six of the nine recordings originally released on In Concert, and three of its five previously unreleased performances are different recordings of songs also featured on In Concert -- "Why Does Love Got to Be So Sad?," "Tell the Truth," and "Let It Rain." The other two, "Nobody Knows You When You're Down and Out" and "Little Wing," have not been heard before in any concert version. Even when the same recordings are used on Live at the Fillmore as on In Concert, they have, as noted, been remixed and, as not noted, re-edited. In either form, Derek and the Dominos' October 1970 stand at the Fillmore East, a part of the group's only U.S. tour, finds them a looser aggregation than they seemed to be in the studio making their only album, Layla and Other Assorted Love Songs. A trio backing Eric Clapton, the Dominos leave the guitarist considerable room to solo on extended numbers, five of which run over ten minutes each. Clapton doesn't show consistent invention, but his playing is always directed, and he plays more blues than you can hear on any other Clapton live recording. Wishing to escape the superstar expectations that sank Blind Faith before it was launched, Eric Clapton retreated with several sidemen from Delaney & Bonnie to record the material that would form Layla and Other Assorted Love Songs. From these meager beginnings grew his greatest album. Duane Allman joined the band shortly after recording began, and his spectacular slide guitar pushed Clapton to new heights. Then again, Clapton may have gotten there without him, considering the emotional turmoil he was in during the recording. He was in hopeless, unrequited love with Patti Boyd, the wife of his best friend, George Harrison, and that pain surges throughout Layla, especially on its epic title track. But what really makes Layla such a powerful record is that Clapton, ignoring the traditions that occasionally painted him into a corner, simply tears through these songs with burning, intense emotion. He makes standards like "Have You Ever Loved a Woman" and "Nobody Knows You (When You're Down and Out)" into his own, while his collaborations with Bobby Whitlock -- including "Any Day" and "Why Does Love Got to Be So Sad?" -- teem with passion. And, considering what a personal album Layla is, it's somewhat ironic that the lovely coda "Thorn Tree in the Garden" is a solo performance by Whitlock, and that the song sums up the entire album as well as "Layla" itself.